From gym bunnies flooding Instagram with workout pics to consumers being willing to pay more for healthy snacks, no one can deny that staying fit is becoming more important on these shores. However, despite having acquired a taste for clean living, most people still retain an appetite for great cuisine. By understanding this paradox Broccoli Pizza & Pasta, the Italian-food franchise, has been able to grow from its humble beginnings in Dubai into becoming an international powerhouse serving up mouthwatering dishes across the globe. But the success of the franchise was no accident. In fact, it was the result of a plan carefully laid by a Middle Eastern and family-run investment group based in the United Arab Emirates that founded the franchise. “The idea came about around 2009,” says Charlie Mander, European franchise manager at Broccoli Pizza & Pasta. Not only did the founders envision a company that would take advantage of the rising health trends but also drew inspiration from other franchise giants. Indeed, by adding a pinch of customisation options to the inspiration from other franchises’ pizza offerings, the new enterprise aspired to cook up a business recipe greater than the sum of the two. “We thought combining them would be a great opportunity,” Mander says. While eager to make the idea a reality, the company took care not to jump headfirst without testing the waters. “We did a lot of research,” says Mander. For starters, the founders ensured they understood the market. Moreover, recognising how businesses in the sector could grow exponentially through franchising, the team set out to franchise the business from the get-go and reached out to Francorp, the franchise consultancy, for guidance. “That ensured the business would be offering a sustainable and successful structure, enabling us to grow globally,” says Mander. By 2011 the founders felt ready to set the plan in motion and launched their first restaurant in Barsha Heights in Dubai. While the eatery benefitted from being located in a commercial area within delivery distance to residential neighbourhoods, the franchise’s coup de grace was its rich menu. “Broccoli Pizza & Pasta offers a unique concept as the customer can fully customise their meal, adding ingredients of their choice in order to produce a meal which matches their dietary requirements,” says Mander. “All ingredients are prepared daily on site to ensure maximum freshness and quality products.” But even with such succulent servings on offer, the owners didn’t leave the success of the business to chance. Instead, word about Broccoli Pizza & Pasta was carefully spread through leafletting, daily offers and networking within the local business community. And it didn’t take long before these efforts paid off. “Any new concept takes time to grow but within six months we were already looking for our second site,” says Mander. With the company-owned pilot having proven itself a roaring success, the franchisor set out to find its first franchisees. But doing so wasn’t without challenges. “[Because there’s] minimal knowledge of franchising in Dubai, we had to market the franchise opportunity in store and [through our] local contacts,” Mander says. Fortunately, this proved a winning recipe and the franchisor quickly found its first franchisees. Staying true to form, the team didn’t leave the franchisees’ success to fate. “Initially, we would fully project-manage each and every new restaurant and we would even operate it for the first two months at no extra cost,” Mander says. “This was paramount for us to ensure the first restaurants were operating at their full potential and allowed us to create textbook case studies.” Given the lengths the franchisor went through, it’s hardly surprising that the first franchise became a smash hit soon after opening in 2013. Armed with the knowledge acquired through its native market, the franchisor decided to expand internationally three years later. First stop: the UK. “We wanted to challenge ourselves by going straight into a very competitive and expensive market,” Mander says. The franchisor certainly got its wish when it contacted British authorities and found out how many regulatory hoops it had to jump through before opening. “[We] were surprised at the number of steps [it took to be compliant when operating] a franchise,” he says. Moreover, moving into a new market also meant adjusting to the British palate. “In the Middle East they like their food quite salty but we had to reduce the salt content in the UK,” says Mander. “Also, in the Middle East all water is bottled but here we obviously use tap water, which has lots of minerals that affect the yeast in the dough.” However, being able to rise above these challenges was important for the new franchisor because it proved the company could make similar adjustments in any new market it would enter in the future. “When we opened in India we removed all beef from the menu, increased the spice levels and introduced things like chicken-tikka pizza to make it fit the local market,” he says. 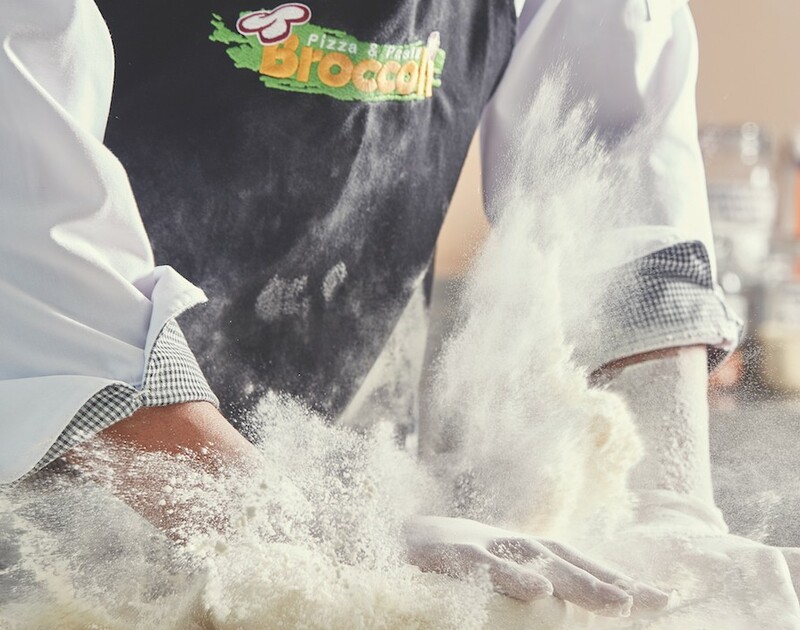 Having overcome both regulatory hurdles and cultural ones, the first UK-based Broccoli Pizza & Pasta restaurant opened for business in July 2016 and quickly became successful. With this proof of concept in the bag, the franchisor was ready to start looking for British franchisees. “We used various online portals and went to exhibitions,” says Mander. These efforts paid off when a prospective franchisee from Manchester reached out. While he dazzled the franchisor with his outstanding local knowledge and solid business plan, it was his willingness to go above and beyond to be part of the network that persuaded the franchisor to let him join. “[He] was willing to provide his full dedication to the brand, so much so that he travelled and stayed in Dubai for a number of weeks to learn and understand the operations,” Mander says. Recognising how every franchise is only as successful as its franchisees, Broccoli Pizza & Pasta is committed to ensuring all members of its network get off to a great start. “Our support structure sets us apart from [our] competitors,” Mander says. “We offer a very hands-on approach to each project to make sure the franchisee is never left in the unknown.” Kicking off this support, each new franchisee benefits from help with selecting the store’s location, analysing the market and designing the restaurant. Moreover, they also receive between ten and 14 days of initial training before the launch of the restaurant, which is followed by seven days of on-site training. And the support doesn’t end at the official opening but the franchisor will always be ready to offer a helping hand. “We don’t charge for [it because] if each store operates to its full potential, [then everyone benefits],” says Mander.